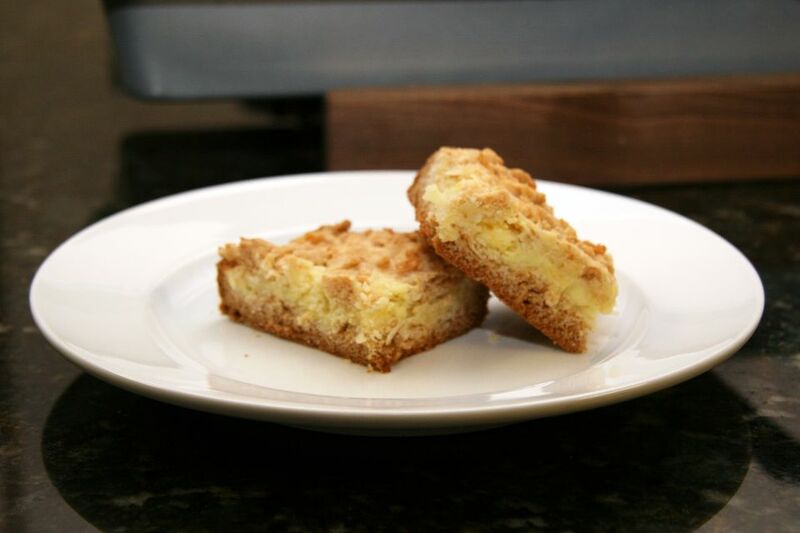 A cake mix makes these bars extra-easy to prepare, and the lemon juice, zest, and coconut add extra flavor. These are delicious little bars to make for a spring event or a weekend treat. The fresh lemon zest is the key to the flavor, and the coconut adds that "something extra." Grease and flour a 13-by-9-by-2-inch baking pan baking pan or spray with baking spray (the kind with flour). Heat oven to 350° F (180° C/Gas 4). In a mixing bowl with an electric mixer, beat the cake mix with 1 egg, the melted butter, and coconut until well blended. The mixture will be crumbly. Reserve 1 cup of the crumb mixture and set aside. Pat the remaining crumb mixture into the bottom of the prepared pan to form the crust. Bake the crust for 12 minutes. Remove from the oven. While the crust is baking, in another bowl with an electric mixer, beat the cream cheese with the lemon juice, zest, sugar, and the remaining egg, scraping the bowl once. Beat just until well blended. Spoon the cream cheese mixture evenly over the baked crust. Sprinkle reserved crumb mixture over the cream cheese layer. Bake for 25 to 30 minutes, or until topping is lightly browned. Store leftover bars in the refrigerator.